A simplified design for small broadband RF transformers using medium µ ferrite core for receiving use. The specific application is an input transformer to a nominally 2kΩ receiver at around 9MHz (a panadapter). 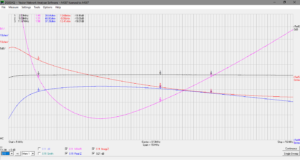 This article continues with the design discussed at BN43-2402 balun example, but using a 2t primary and 16t secondary for a nominal 1:64 50:3400Ω transformer (though at high ratios, the transformation is only nominal). 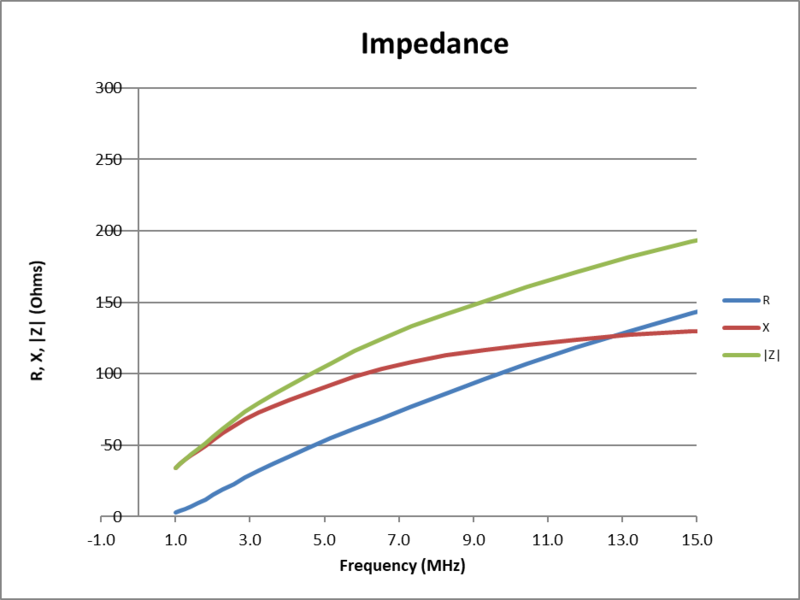 A small core makes for short windings to obtain high frequency performance, and sufficient turns are needed for low end… but not too many as it restricts the high end. The high number of turns on the secondary will limit high end performance, but that is not an issue in this application which is a fairly narrow band receiver at 9MHz. 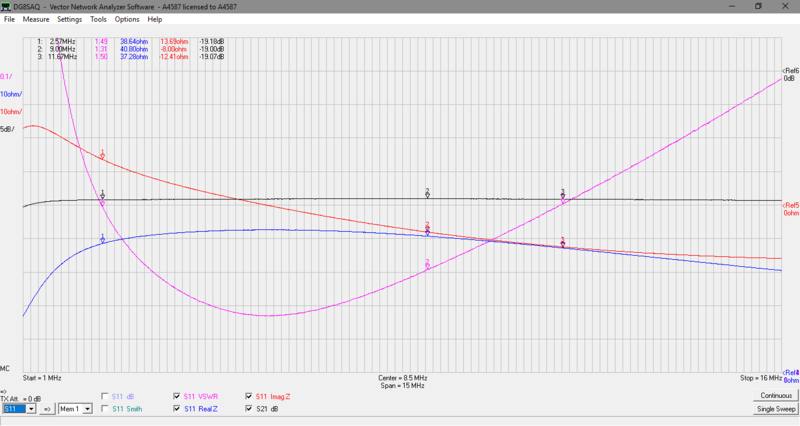 A quick analysis using the method in BN43-2402 balun example hints that a 2t primary is probably good enough down to 4MHz, depending on one’s limit for InsertionVSWR. We are not being too fussy here… this is not an application that demands InsertionVSWR < 1.5. 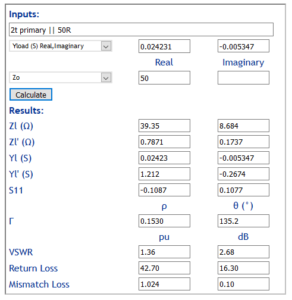 …we have InsertionVSWR=1.36, that is fine for our application. This is only a rough indication of suitability, the final test is a VNA sweep of a prototype. Above is a VNA sweep of a prototype wound with 0.25mm ECW. It is quite a tight fit, and smaller wire (eg 0.15mm ECW) is recommended as more practical. The load resistance is a resistor with DC resistance of 3,225Ω in series with the VNA 50Ω input port. 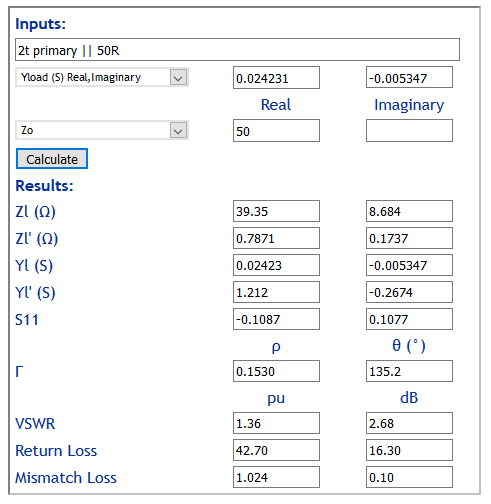 Because of the power division between that resistor and the input port, we expect that |S21| of a matched lossless transformer would be 10*log(50/3275)=-18.16dB. 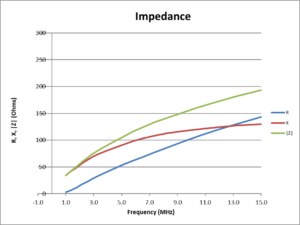 The input impedance mid band implies a mismatch loss of around 0.1dB, and allowing for up to 1dB of loss in the transformer, the measured |S21| is quite within expectation. The response is quite acceptable for the application.